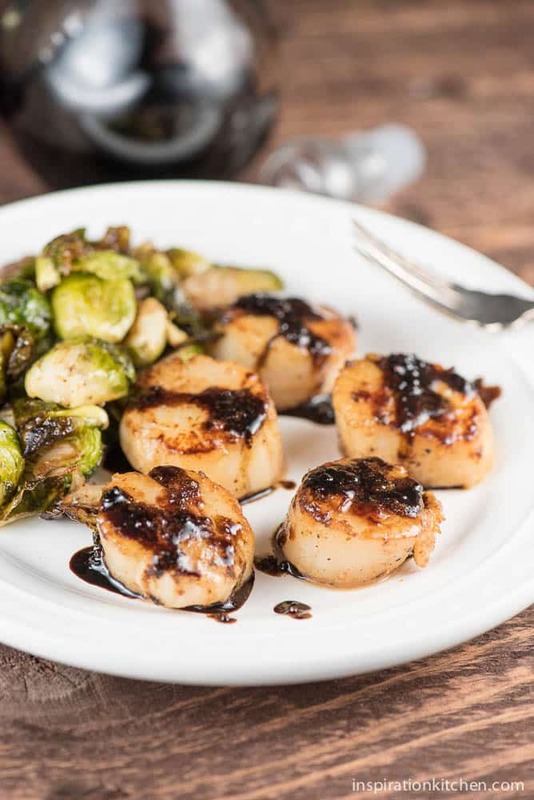 These Seared Scallops with Balsamic Reduction are a great combination of savory and sweet topped with a delightful mix of honey and garlic chile sauce. to ease your tax woes. CLICK HERE FOR A CHANCE TO ENTER AND WIN! Although on Monday I treated you to some pre-tax soul-soothing Peanut Butter Chocolate Chip Cookies – today, we’re going all-in for post-tax indulgent, decadent Seared Scallops. So help me dear readers… Have you read a dozen times (like I have) that scallops are notoriously hard to cook? For pete’s sake…with all I’ve read, one would think that anyone but an experienced chef would be terrified to make these delicious treats. I say, pppfffttt to that! I’m here to assure you, they aren’t hard to make at all. In fact, they are really easy to make, as long as you know how they want to be cooked. Gently. 🙂 And not over done. That’s not to much to ask, right? And, when these decadent babies are $19.99/pound, we want to get it right the 1st time! And you can. With the right temperature, an attention to detail and a watchful eye. And the next thing you know, you have perfectly tender, succulent scallops every.single.time. Scallops themselves come with a wonderful seafood flavor, but alone can be a bit bland. And, this recipe is where it brings all the flavors together. With a balsamic vinegar reduction enhanced by honey and chile garlic sauce – you have it all. The tang of vinegar, the sweet of the honey and the spicy of the chile garlic sauce. The triple threat of all things scallops. You will love it! Here’s a tip I use…when I buy my scallops, I ask for the smallest scallops possible. In my opinion (your mileage may vary), but I find that the smaller ones are less fishy, sweeter in flavor and they cook fast and easy! What I also love about them, is that they are beautiful, elegant and such a nice change from standard fish and seafood. Are they a treat? They are at my table, so I would say yes. Yet, every single time, they deliver great flavor and a dish worthy of inviting guests! The other *important* thing I want to share about scallops…whatever you do, do *NOT* over-cook them. Scallops are an amazingly tender, mild flavored seafood that are fabulous when prepared correctly. When over-cooked, they can be tough, rubbery and spongy. Nuh uh! At nearly $20/pound, who wants to take a chance and mess that up? Certainly not me. 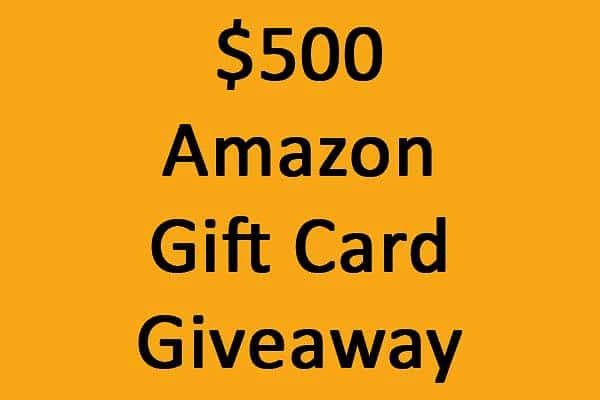 So…now that you know how to cook scallops and will be an expert at it, go enter our little Giveaway ($500 Amazon Gift Card) to ease any of your tax woes! 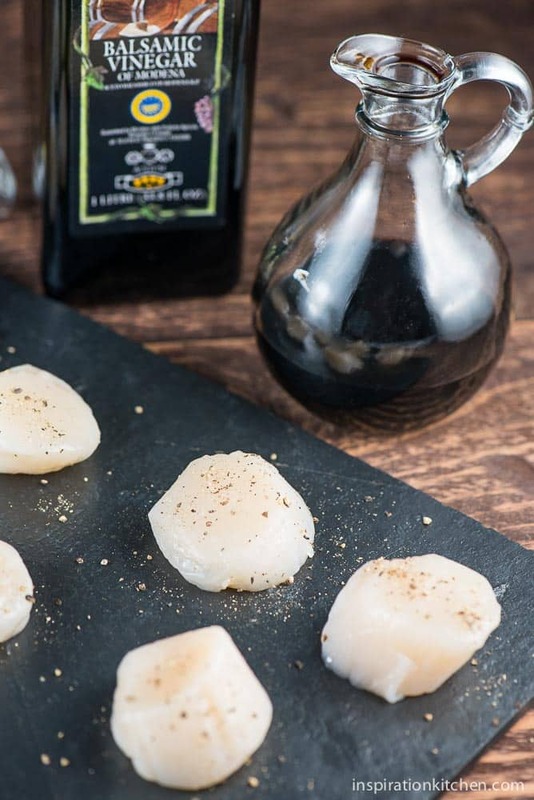 These Seared Scallops with Balsamic Reduction are a great combination of savory and sweet with a combination of honey and garlic chile sauce. Heat balsamic vinegar on high until boiling. Reduce heat to medium-low and cook until reduced by one-half. Add mustard, honey, chile garlic sauce and 1 tablespoon of butter and turn down to low. Heat for 1-2 minutes, remove from heat and set aside. Sprinkle both sides of scallops with salt and pepper. Heat remaining 2 tablespoons of butter in a large non-stick skillet over medium-high heat. Add scallops and cook 3 minutes on each side or until a golden crust begins to form. Remove from heat, place on paper towel and let drain. Place on serving plate, lightly drizzle with balsamic vinegar **(see note)** sauce and serve. 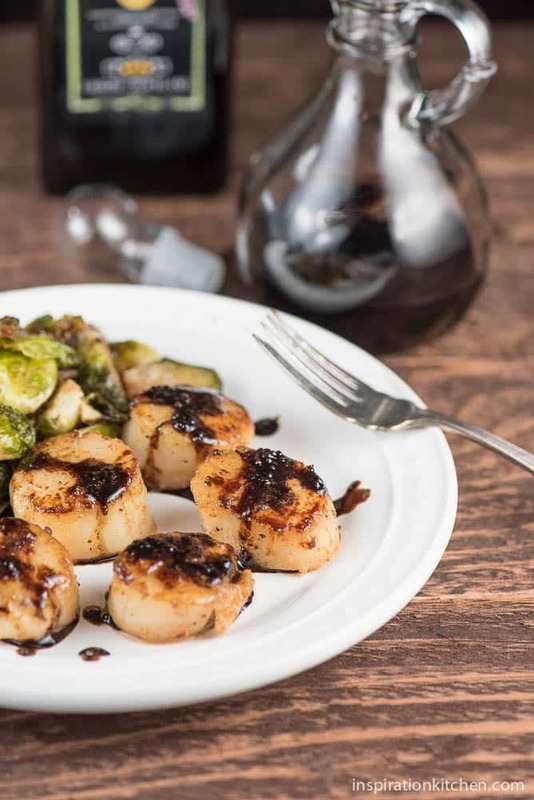 **You can either LIGHTLY drizzle the scallops with sauce (if you put to much sauce on, the balsamic vinegar will overpower the scallops - and you don't want that!). OR, you can put the balsamic at the bottom of the skillet while cooking to sear one side of the scallops with the sauce - it's amazing either way - whatever method you want to use! These are great tips, Kristi. Thanks! The only way I’ve cooked scallops is on the grill. You really have to watch them there, too. We adore scallops and love to order it when we’re eating out. It was only very recently that I finally managed to get a proper sear on scallops at home! For me, I have to get dry, not water-ladened, scallops and use my cast iron pan. I love your balsamic reduction and those brussels sprouts really round out your plate here. That is a very interesting tip on the smaller scallops – thanks! Kristi – I (too) hate that feeling your wallet gets after taxes… that lighter than air, Help! Fill me back up! feeling. But what I don’t hate. At. All…not even in the slightest… these scallops!! 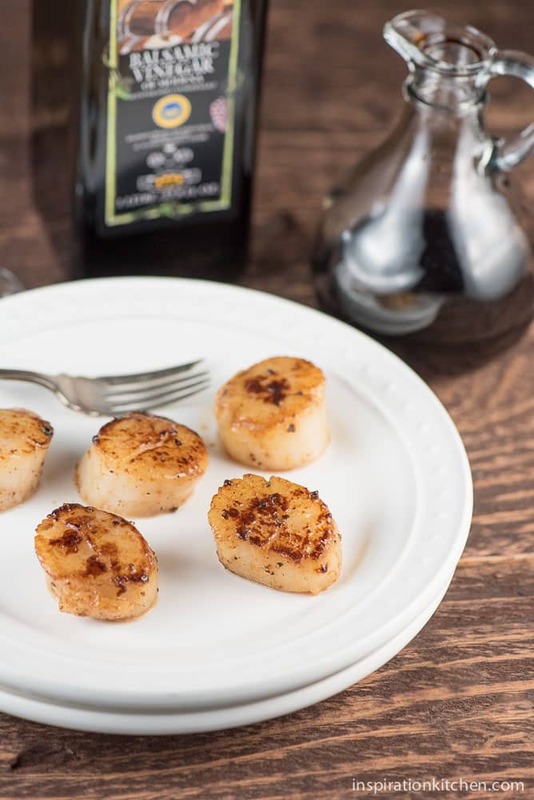 I adore scallops with balsamic, but I never thought of adding honey! AND chili garlic sauce! Yuuuuu-uuuummy! Totally making these! 🙂 Cheers! I’m so glad you like the scallops Cheyanne! And, I’m with you – taxes leave me deflated! I hope you have a great weekend! Me too Melissa. The less ingredients the better. So glad you like the recipe! Have a great weekend. Thanks Juliana! I loved the tart, sweetness too. Scallops are such a nice change. I hope you have a fabulous weekend! Thank you for hosting that wonderful giveaway! Thank you Catherine. The balsamic added such a great flavor, which really took the scallops over the top in flavor. You’re right – they are an elegant dish. I do sometimes find scallops hard to cook simply because of not knowing when they are done. Thanks for the inspiration. These look amazing! Thanks Melanie! I’m glad you like them. I really love having scallops at the table every once in a while! Scallops are my favorite seafood! Yours look divine with that balsamic glaze! Thanks Christin! We don’t have them very often, but we do love them when we do. Have a great weekend! I’m cracking up, Kristi – great minds think alike. 🙂 I just posted seared scallops today…we need to get together for dinner because apparently we have the same taste in food. Hahaha! Great minds think alike. But, I’m not surprised Marissa – I love your blog, because my sistah, we have the same taste! xoxo Going to check out your scallops now and drool! Have a great weekend! Thanks Marcie! You come over and I will make you scallops. We’ll have wine and catch up on all the things we don’t talk about in email. It’s hard to believe there’s anything more to talk about, right? Haha! xoxo Have a great weekend, and thank you for the pin. Have a beautiful weekend. Thank you. I’m so glad you like them! Thanks Sarah! 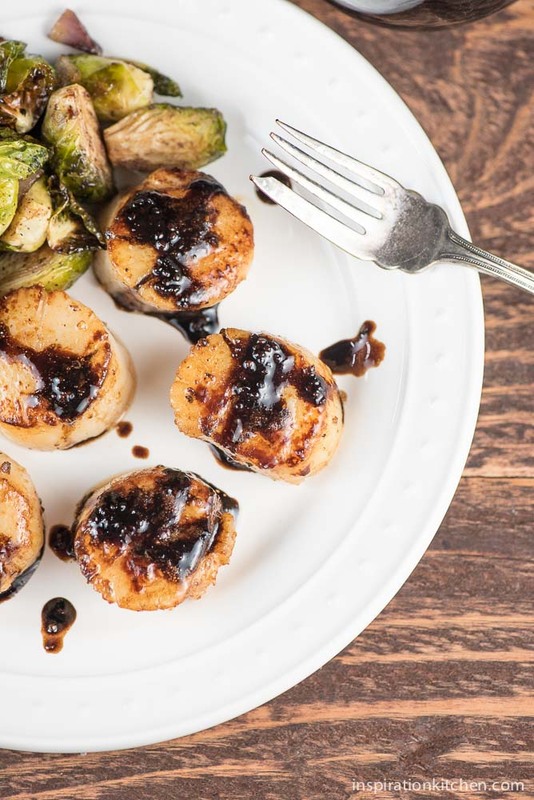 The balsamic reduction was such a great addition to scallops – if you make them, I think you’ll love it! The balsamic reduction sounds amazing! Its bold flavor balances so well with the sweet,tender scallop. Thanks Thao! The balsamic reduction was amazing, and it was perfect with the scallops. Aw man – you made me realize it’s been forever since I’ve had scallops! These sound so smooth and tender and paired with a balsamic reduction? This sounds incredible!